I found Dad’s root beer at my local dollar store (which I’ve grown to love to find so many second-rate products), I don’t know anything about it but I’m always up for trying a new root beer hoping it will be a new favorite, which I think I did find but I have to do more research on how to get a bottle since I just had it from a tap in a little store in the middle of NH. Anyhoo, the available opponent this time was A&W so we sat these two down and let them battle it out. I thought I’d try a different angle with the drink photos (I’ll go back to the old way), but the A&W looked pretty lighta nd the foam didn’t last more than a few seconds after it was poured. We liked the taste of this, it was very “peppy” to me and Ethan said it had a good, dependable root beer flavor and the sweetness was just right. For me I’d like it to be a little creamier like this mystery tap rootbeer I had in NH but the flavor of A&W is really satisfying. I was impressed with Dad’s because the foam didn’t completely dissolve even after sitting for an extended amount of time and had a nice deep brown color. We felt this had an interesting aroma, which Ethan described as “herby”. As far as flavor it was flatter than A&W and tasted artificial, which goes to show foam isn’t everything. Even though it doesn’t look as impressive, the deep flavor and “zazzyness” of A&W really makes it a more satifying root beer than Dad’s. It’s not a terrible soda but we wouldn’t go out of our way to buy Dad’s again. Dads?? Never heard of it. I, too, am impressed with the foam. How about a Root Beer Float? Was the rootbeer you had on tap in NH Frost Top? 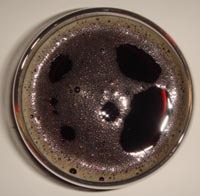 Frost Top is a popular on tap root beer in the Midwest. I’m a HUGE fan of Dad’s. I grew up with it in California, but can’t find it in Michigan. It’s definitely my ideal root beer flavor, and that might be why root beers like A&W, etc just don’t seem right. WHERE did you find Dad’s in a plastic bottle? I’ve never met anyone who likes Barq’s. Never. Mug is the easiest to find usually. I for one aviod Barq’s like the plague. It’s awful. I forgot to mention: Dad’s normally comes in a glass bottle in these parts. But then, we use real sugar in our sodas, so I can understand how it might be different. Maybe A&W uses real sugar in the US? I don’t know. A&W root beer tastes like Pepto Bismol. It really does. The best root beer on the market is IBC root beer company. I also believe that Barq’s has a good flavor. I agree with Eddie re: IBC root beer- it is creamy and good! The best by far though is the home brew at my local drive in. It is OMG good so if you’re ever in Northern Indiana and want unbelieveable root beer let me know! I should send you guys a bottle of Frost Top root beer to try out. Frost Top and A&W are the only “mainstream” root beers I buy. actually i think the Dad’s in plastic at the Dollar Tree and the like is not as good at the glass bottled kind. i believe the bottlers are different, but i could be wrong. i believe Dad’s is usually better than A&W though. A&W is kind of my standard of what mainstream “root beer” taste is. 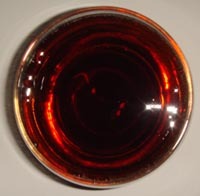 i have reviewed like 420 root beers, birch beers and sarsaparilla on my site if you want to check it out. i will have to read more on here, seems a great concept. Huge root beer fan, diet root beer actually, Dad’s diet root beer is one of my favorites for sure, FrosTop is the best though, hands down. I gave my dad some diet FrosTop and he started singin and ravin that he hasn’t had root beer that good since he was a kid. Now I give him a case of it every time I see him. A&W, I don’t know what it is but I just don’t care for it, maybe its the vanilla flavor? Almost more of a cream soda sorta somthin, I dunno. All you root beer fans, give the diet non sugared versions a chance, so much more flavor. I’ve seen Dad’s in a plastic bottle at my local gas station. They also had Orange Cream Soda,Cream Soda,and I think Diet Rootbeer. 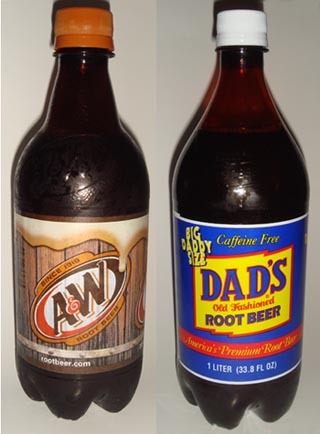 A&W would also be a good contender against Dad’s in a cream soda battle,although they do make Mug and Barq’s cream soda. Dad’s is definitely the best root beer around. I’ve been drinking it since I was a kid, and didn’t realize it might not be as prevalent in other parts of the country. I usually had Barq’s in my lunch box though. I don’t like A&W as much, but that might be because I didn’t have A&W until I was a teenager and found a random hot dog restaurant at a mall once. @Gregory: Gregory, ask Dr.Pepper/7UP if A&W has natural sugar. i would like to order a root beer A/W. Please conduct me. I agree with the zazzyness of A&W, and I’ve had many people say that I’m quite zazzy myself!